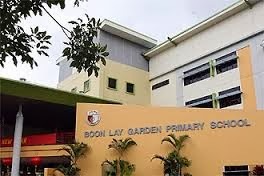 Boon Lay Garden Primary School is located at 20 Boon Lay Drive in Singapore 649930. It is enclosed within the Boon Lay Region. Boon Lay is a small housing estate situated at the western section of Singapore. It is sandwiched between Jurong West and Jurong West Extensnion. Subzones in the area include Tuakng, Samulun, Liu Fang and Shipyard. Nearest MRT is Lakeside MRT station and nearest Bus Interchange is Boon Lay Bus Interchange. Amenities in the area include Jurong Point, Taman Jurong Shopping center, Cheers Convenience Store, NTUC Fairprice and Sheng Siong Supermarket. Other Schools close by are Jurongville Secondary School, Lakeside Primary School, Rulang Primary School, Shuqun Primary School and Jurong Junior College.